The main thing you will usually find on a printer statistics page is information about your usage of the machine. This often includes a count of the total pages printed, the pages printed with a certain cartridge, and other metrics. These stats can be especially useful when trying to estimate whether you are getting the rated number of pages from your supplies. For multifunction devices, you may see statistics for the number of pages scanned, faxed, copied, etc. This could be helpful when deciding if your next printer needs to have faxing capabilities, for example. If you find that the number of pages faxed is very low, this may not be an essential feature in the future. Some statistics pages also include information about certain errors that have occurred. You may see a count of the number of paper jams, misfeeds, and other problems. This can give you an indication of the most common problems your unit encounters, and you might be able use this information to improve reliability. If your printer is experiencing a lot of misfeeds, for example, you should consider cleaning the printer rollers. By printing another statistics page later, you can compare to see if reliability has improved. Perhaps the most useful aspect of the statistics page is the specific information provided about each cartridge. For a color model, you will usually see a breakdown of each individual color. 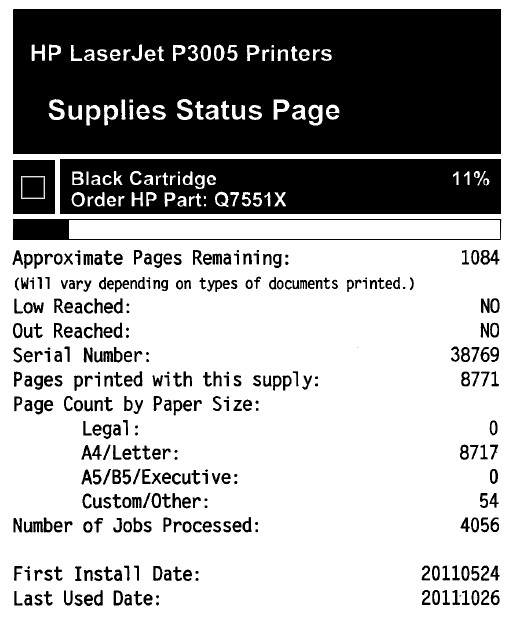 If the printer is telling you a certain color is empty, but only a small number of pages have been printed with that supply, you can confirm this with the statistics page, which might mean you have a defective cartridge. The printer statistics page can be a very useful tool for gleaning important information about your printer. By regularly printing and saving these pages, you can track any trends such as increased errors, and address them when necessary. The process for printing a test page varies for each device, so you should consult your manual for specific instructions.